If you are new to Okino and our software then please take a moment to read this page about what has made our software's usage so wide spread throughout the 3D industry. Okino's core and founding philosophy has been "one to one" personal customer communications, an often overlooked and neglected aspect of today's software industry. Our well known software is used throughout the world by many tens of thousands of 3D professionals in mission & production critical environments, backed by respectable personal support directly from our core development team. As engineers, we take the development and deployment of this software very seriously. Okino software is (ideally) tailored to the MCAD & DCC conversion requirements of each of our new or existing users. Hence, before you delve into the Okino WEB site, please take a moment to follow step (1) of our software evaluation process. Robert Lansdale, our CTO, is a walking Wikipedia of the 3D graphics and data translation fields, drawing on 30+ years of data translation, animation & rendering development for all major 3D MCAD and animation packages. Robert will explain exactly what configuration of the software is needed as well as how it is to be best used for error-free conversions. native conversions for CINEMA-4D, LightWave and dozens more. NuGraf is Okino's primary software product. For $100 extra it contains all the functionality of PolyTrans in addition to full material & texture editing, photon mapped based caustics, multi-threaded ray tracing, interactive texture projections and much more. It is the preferred solution unless you only need to run PolyTrans inside 3ds Max or Maya. Copyright 1994, 2019 Okino Computer Graphics, Inc. All rights reserved. 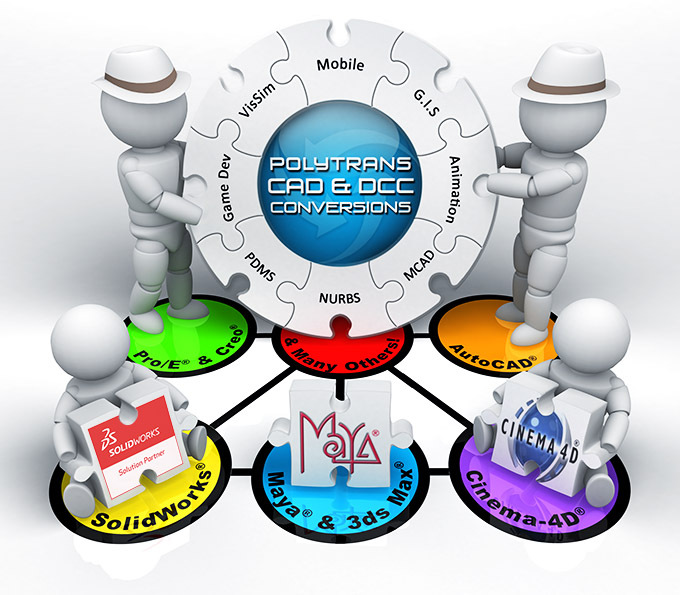 'Circular puzzle diagram' registered trademark owners: 'DSS' & 'SolidWorks' of Dassault Systemes, 'AutoCAD' & 'Maya' of Autodesk, 'Cinema-4D' of MAXON Computer and ProE & Creo of PTC. (Okino is a registered solutions provider to each of these aforementioned companies).